To Cite: Arıcan H, Doğan Bakı E, Koca H B, Karasu N, Sıvacı R. Comparıson of I-Gel Laryngeal Mask and Endotracheal Tube Effects on Inflammatory Response in Hand Surgery, Ann Anesth Crit Care . Online ahead of Print ; 3(2):e79858. doi: 10.5812/aacc.79858. Background: Anesthesia and surgery together can cause endocrine and metabolic changes by creating a stress response. Objectives: This study aimed to compare the effects of two different applications of general anesthesia on the immune system by measuring serum cytokines in patients undergoing hand surgery. Methods: The study included 40 patients undergoing hand surgery with American Society of Anesthesiologists (ASA) physiological status I to III and ages between 18 and 65. The patients were randomly divided into two groups including I-gel LMA (group 1) and endotracheal tube (group 2). Blood samples were taken from all patients before anesthesia induction (T0), five minutes after the induction (T1), one hour postoperatively (T2), and 24 hours postoperatively (T3) for IL-1β, TNF-α, IL-6, and IL-8 analysis. The attempt numbers and the placement time of airway devices were noted in both groups. We also recorded patients’ perioperative OAB, pulse, saturation, SPI, and ETCO2. 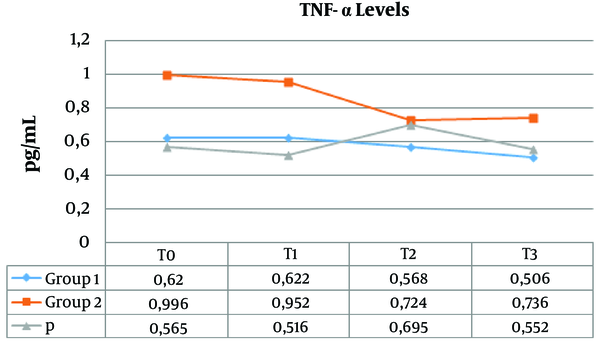 Results: There was no difference in TNF-α, IL-1β, IL-8, and IL-6 levels between the groups. When we compared trial periods, it was seen that I-gel LMA was statistically placed faster than laryngeal tube. Conclusions: One of the ways to reduce surgical stress is to minimize invasive procedures as much as possible. Although I-gel LMA did not reduce inflammation or stress response, placing it was faster than the endotracheal tube and this may give an advantage in favor of I-gel. Although endotracheal intubation is the gold standard for the safety of the airway during anesthesia, laryngoscopy and intubation are known to have side-effects such as increased plasma catecholamine levels, hypertension, tachycardia, arrhythmia, myocardial ischemia, and intracranial and intraocular pressure elevation (1). During laryngoscopy and tracheal intubation, the stimulation of the supraglottic area causes an increase in the sympathoadrenal response and catecholamine levels. Passage through the vocal cord of the endotracheal tube and inflation of the cuff in the infraglottic region are rare (2). In this response, the contribution of the endotracheal tube from the vocal cord or inflation of the cuff in the infraglottic area is less (2). In elective and emergency surgical interventions, many supraglottic airways have been successfully used to provide and ensure airway safety. The laryngeal mask (LMA) with an inflatable cuff has been the most commonly used supraglottic device in the last decade (1). I-gel is a new type of laryngeal mask with no inflatable cuff. Due to the I-gel thermoplastic elastomer structure, it softens at body temperature and is fully compatible with the supraglottic texture, thus minimizing air leakage. In addition, the presence of a gastric drainage tube that allows nasogastric catheter entry reduces the risk of aspirating stomach contents into the lungs. The oropharyngeal cavity is adapted without malrotation due to the hard-bite protective part that keeps it fixed in the mouth (1). Surgical stress affects many systems, especially the immune system, leading to different responses. In addition to surgical stress, factors such as the direct pharmacological effect of the anesthetic used, the type of anesthesia, and duration and depth of the anesthetic also have an effect on the resulting responses (3). The combination of anesthesia and surgery can cause endocrine and metabolic changes by creating a stress response. In this study, we aimed to compare the effects of two different applications of general anesthesia on the immune system by evaluating serum cytokines in patients undergoing hand surgery. Approval for the study was granted by the Local Ethics Committee of Afyon Kocatepe University (No. 2016/3-26, 04.11.2016 dated) and written informed consent was obtained from each patient. Overall, 40 patients with American Society of Anesthesiologists (ASA) physical status I-II, aged 18 - 65 years, undergoing hand surgery were enrolled in the study. Patients with a history of difficult intubation, hemorrhagic diathesis, gastroesophageal reflux or previous head or neck surgery, patients with a mouth opening of < 2 cm, uncooperative and obese patients were not included in the study. Patients were randomized into either the I-gel group (group 1, n = 20) or endotracheal tube group (group 2, n = 20). All patients were evaluated one day preoperatively to measure thyromental distance and sternomental distance. Height, weight, body mass index (BMI), and Mallampati scores were also recorded. Patients were not premedicated. Upon arrival in the operating room, standard anesthesia monitoring was applied including non-invasive blood pressure, pulse oxygen saturation, electrocardiograms, and capnograms. Hemodynamic parameters were recorded during the operation. Anesthesia was induced with propofol 2 mg/kg, fentanyl 2 mcg/kg, and midazolam 0.01 mg/kg. The intubation was facilitated with 0.6 mg/kg rocuronium 0.6 mg/kg in group 2. Ventilation was performed using a mask until the airway became suitable (lash reflex disappearance, jaw relaxation, immobility, and apnea development) for repositioning the airway device. The appropriate size of I-gel was placed in group 1 patients and the proper size of the endotracheal tube was used in group 2 patients. Anesthesia was maintained with a remifentanil infusion (0.3 - 0.5 mcg/kg/minute) and sevoflurane 1 MAC with a fraction of inspired oxygen (FIO2) of 50% in air. The patients were ventilated with controlled volume mechanical ventilation with a tidal volume of 7 mL/kg with a respiratory rate of 12/minute. The demographic data of the patients, as well as intraoperative mean arterial pressures, heart rates, and end-tidal CO2 values, were recorded. We also noted the number of attempts to apply the airway device and the duration of the application time. At the end of the surgery, 1 g paracetamol and 1 mg/kg tramadol were administered to all patients. Anesthetic gases were closed at the end of the operation and patients were ventilated with 100% oxygen. The effect of the muscle relaxant was reversed with sugammadex 2 mg/kg in patients applied with the endotracheal tube when the spontaneous respiratory motion started. The airway device was removed when the patient regained consciousness. The patients were transferred to the post-anesthesia care unit after extubation. For the examination of tumor necrosis factor alpha (TNF-α), interleukin-6 (IL-6), IL-1β, and IL-8, venous blood samples were taken from all patients before the anesthesia induction (T0), five minutes after induction (T1), one hour postoperatively (T2), and 24 hours postoperatively (T3). The data were statistically analyzed using the Statistical Package for Social Sciences (SPSS) for Windows 20.0 software. The Shapiro Wilk test was used to verify the normal data distribution. The data were expressed as means ± standard deviation (SD), median (min - max), and percentages. Continuous variables were analyzed using the student’s t-test or the Mann-Whitney U test for parametric and non-parametric data, respectively. Categorical variables were analyzed using the chi-square test or the Fisher exact test. The results were evaluated at a confidence interval of 95% and a significance level of P < 0.05. In the current study, 20 patients were included in each group, all of whom completed the study. Patients’ characteristics were similar between the groups (Table 1). There was a statistically significant difference between the two groups in terms of the placement time of the I-gel laryngeal mask and endotracheal intubation. The placement time was 11.04 ± 1.02 seconds in group 1 and 12.43 ± 1.57 seconds in group 2 (P = 0.002, Table 1). No statistically significant difference was found between the two groups in terms of the number of attempts to place the device (P = 0.633, Table 1). a Values are expressed as mean ± SD, No. or No. (%). b Group 1: I-gel LMA; Group 2: endotracheal tube. When the mean arterial pressure and heart rates were compared according to the groups, no statistically significant difference was found between group 1 and group 2 (Tables 2 and 3). There was no statistically significant difference between the groups at any time point in respect of the TNF-α, IL-1β, and IL-8 values (Figures 1 - 3). Abbreviations: MAP, mean arterial pressure; T1, before anesthesia induction; T2, five minutes intraoperatively; T3, 10 minutes intraoperatively; T4, 20 minutes intraoperatively; T5, 30 minutes intraoperatively; T6, 40 minutes intraoperatively; T7, 50 minutes intraoperatively; T8, 60 minutes intraoperatively; T9, the end of anesthesia. a Group 1: I-gel LMA; Group 2: endotracheal tube. Abbreviations: T1, before anesthesia induction; T2, five minutes intraoperatively; T3, 10 minutes intraoperatively; T4, 20 minutes intraoperatively; T5, 30 minutes intraoperatively; T6, 40 minutes intraoperatively; T7, 50 minutes intraoperatively; T8, 60 minutes intraoperatively; T9, the end of anesthesia. Figure 1. TNF-α, levels according to the groups; β, Mann-Whitney U test; group 1, I-gel LMA; group 2, endotracheal tube; T0, before anesthesia induction; T1, five minutes after induction; T2, one hour postoperatively; T3, 24 hours postoperatively. Figure 2. IL-1β, levels according to the groups; β, Mann-Whitney U test; group 1, I-gel LMA; group 2, endotracheal tube; T0, before anesthesia induction; T1, five minutes after induction; T2, one hour postoperatively; T3, 24 hours postoperatively. Figure 3. IL-6, levels according to the groups; β, Mann-Whitney U test; group 1, I-gel LMA; group 2, endotracheal tube; T0, before anesthesia induction; T1, five minutes after induction; T2, one hour postoperatively; T3, 24 hours postoperatively. 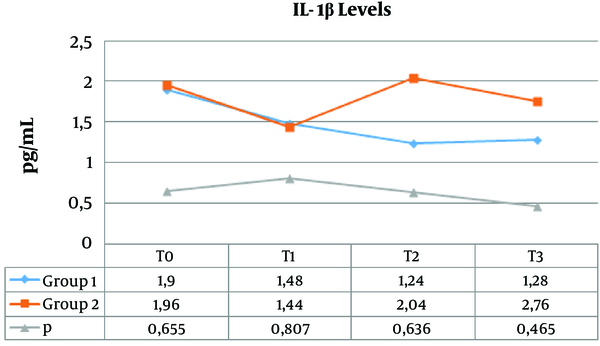 When the IL-6 values were compared between the two groups, the T0 and T1 values were significantly lower in group 1 (P = 0.045 and P = 0.008, respectively) (Figure 4). There was no statistically significant difference between the two groups at T2 and T3. Figure 4. IL-8, levels according to the groups; β, Mann-Whitney U test; group 1, I-gel LMA; group 2, endotracheal tube; T0, before anesthesia induction; T1, five minutes after induction; T2, one hour postoperatively; T3, 24 hours postoperatively. Inflammation is the main process in tissue repair, but increased inflammation can be very dangerous for the maintenance of a normal inflammatory response. It can lead to postoperative complications such as postoperative infections, impaired wound healing, and multiple organ dysfunction (4). TNF-α, IL-1β, and IL-6 have systemic and local effects such as the restriction of injury, the restriction of infection spread, and the establishment of an environment suitable for tissue healing and repair (5). From a review of the literature, no study was found having compared the effects of I-gel LMA and general anesthesia on inflammation. In a study comparing the hemodynamic responses of I-gel, LMA, and endotracheal tube (ETT), it was found that cardiovascular changes were lowest in the I-gel group and this was due to the absence of an inflatable cuff structure (6). In a study by Trivedi and Patil comparing LMA, SLIPA, and I-gel, the cardiovascular response was also found to be lowest in the I-gel group (7). According to Shin et al., the LMA, Proseal LMA, and I-gel, as three supraglottic airway vehicles, have similar hemodynamic effects (8). In the current study, there was no statistically significant difference in hemodynamics between the groups. The most important feature of LMA is the ease of placement. In a study by Arı et al., I-gel insertion time was measured as 21.98 sec (1). Similarly, in the current study, the I-gel placement time was found to be 11.04 seconds, which was lower than the time of endotracheal tube placement. In a study by Richez et al., using I-gel 4 and 5 in a female patient group, the first-time placement success was 97% (9). In the current study, the first-trial success was 90% with I-gel laryngeal mask in 20 patients of group 1 and 85% with the endotracheal tube in 20 patients of group 2. There was no difference between the groups in terms of peak, plateau, mean airway pressures, EtCO2, and compliance in a study of 50 patients in which the ease of use and clinical performance of I-gel LMA and classical LMA were compared (1). Tang et al. revealed no difference between I-gel and endotracheal tubes in respect of ETCO2, PaO2, and PaCO2 levels in 66 patients who underwent posterior fossa surgery (10). In the current study, no statistically significant difference was found between the hemodynamic data of the two groups. Tang et al. used I-gel or endotracheal tubes in 66 patients who underwent posterior fossa surgery. In patients applied with I-gel, a significant decrease was seen in TNF-α and IL-6 levels while patients applied with endotracheal tube showed a significant increase postoperatively (10). No significant change was seen in inflammatory reaction and oxidative stress in either group over time. 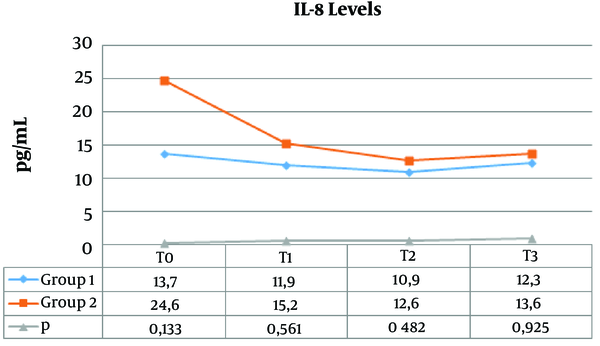 In the current study, the levels of IL-1β, TNF-α, and IL-8 were unchanged in both groups. 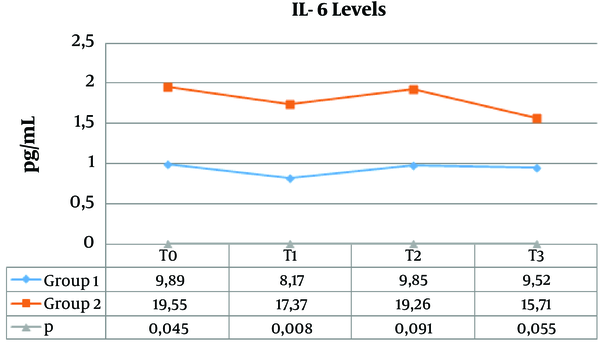 The IL-6 levels remained lower in the I-gel group than in the endotracheal group at all times, which were statistically significant in favor of I-gel LMA before and after induction. This could have been due to the lower preoperative levels of IL-6 in the I-gel group or the shorter implementation time of I-gel. Patients undergoing hand surgery can also be applied with different anesthesia methods other than general anesthesia, such as regional intravenous anesthesia (RIVA) and upper extremity blocks. General anesthesia is usually applied to patients who do not accept neuraxial block. I-gel could be considered a good alternative to the endotracheal tube in general anesthesia. The results of the current study showed less inflammation in the I-gel group, but this should be compared in patients undergoing regional anesthesia. The surgical stress levels of patients will be reduced with the reduction of invasive applications in surgery as far as possible. Although I-gel LMA did not reduce inflammation or stress response, placing it was faster than endotracheal tube placement and this may give an advantage in favor of I-gel. Authors' Contribution: Concept: Hüseyin Arıcan and Elif Doğan Bakı; design: Hüseyin Arıcan; supervision: Elif Doğan Bakı and Remziye Sıvacı; resources: Hüseyin Arıcan; data collection and/or processing: Hüseyin Arıcan, Necmettin Karasu, and Halit Buğra Koca; analysis and/or interpretation: Elif Doğan Bakı, Halit Buğra Koca, and Remziye Sıvacı; literature search: Hüseyin Arıcan, Necmettin Karasu, and Halit Buğra Koca; writing manuscript: Hüseyin Arıcan and Elif Doğan Bakı; critical review: Elif Doğan Bakı, Necmettin Karasu, and Remziye Sıvacı. Ethical Approval: Ethics committee approval was received for this study from the Ethics Committee of Afyon Kocatepe University (No. 2016/3-26, 04.11.2016). Funding/Support: This work was supported by Afyon Kocatepe University Scientific Research Projects Coordination Unit (16.TUS.05). 1. Arı DE, Şanlı CK, Siyahkoç İ, Arslan AH, Akgün FN. I-gel ile klasik laringeal maskenin kullanım kolaylığı ve klinik performans yönünden karşılaştırılması. Turk J Anaesth Reanim. 2015;43:299-303. doi: 10.5152/TJAR.2015.71542. 2. Shribman AJ, Smith G, Achola KJ. Cardiovascular and catecholamine responses to laryngoscopy with and without tracheal intubation. Br J Anaesth. 1987;59(3):295-9. [PubMed: 3828177]. 3. Kılıç R, Yaşar MA, Avcı L, Demirel İ. Alt batın cerrahisi olgularında genel anesteziye eklenen epidural anestezinin plazma sitokinleri ve kortizol seviyelerine etkisi. Fırat tıp Derg. 2005;2:59-63. 4. Cheng CR. Inflammatory response to anesthesia and ways to attenuate it. Adv Anesth. 2005;23:107-41. doi: 10.1016/j.aan.2005.06.006. 5. Kotani N, Hashimoto H, Sessler DI, Kikuchi A, Suzuki A, Takahashi S, et al. Intraoperative modulation of alveolar macrophage function during isoflurane and propofol anesthesia. Anesthesiology. 1998;89(5):1125-32. [PubMed: 9822000]. 6. Ismail SA, Bisher NA, Kandil HW, Mowafi HA, Atawia HA. Intraocular pressure and haemodynamic responses to insertion of the i-gel, laryngeal mask airway or endotracheal tube. Eur J Anaesthesiol. 2011;28(6):443-8. doi: 10.1097/EJA.0b013e328345a413. [PubMed: 21455075]. 7. Trivedi V, Patil B. A clinical comparative study of evaluation of proseal LMA V/S I-GEL for ease of insertion and hemodynamic stability: A study of 60 cases. Internet J Anesthesiol. 2011;27(2). 8. Shin WJ, Cheong YS, Yang HS, Nishiyama T. The supraglottic airway I-gel in comparison with ProSeal laryngeal mask airway and classic laryngeal mask airway in anaesthetized patients. Eur J Anaesthesiol. 2010;27(7):598-601. doi: 10.1097/EJA.0b013e3283340a81. [PubMed: 19915475]. 9. Richez B, Saltel L, Banchereau F, Torrielli R, Cros AM. A new single use supraglottic airway device with a noninflatable cuff and an esophageal vent: An observational study of the i-gel. Anesth Analg. 2008;106(4):1137-9. table of contents. doi: 10.1213/ane.0b013e318164f062. [PubMed: 18349185]. 10. Tang C, Chai X, Kang F, Huang X, Hou T, Tang F, et al. I-gel laryngeal mask airway combined with tracheal intubation attenuate systemic stress response in patients undergoing posterior fossa surgery. Mediators Inflamm. 2015;2015:965925. doi: 10.1155/2015/965925. [PubMed: 26273146]. [PubMed Central: PMC4529951].